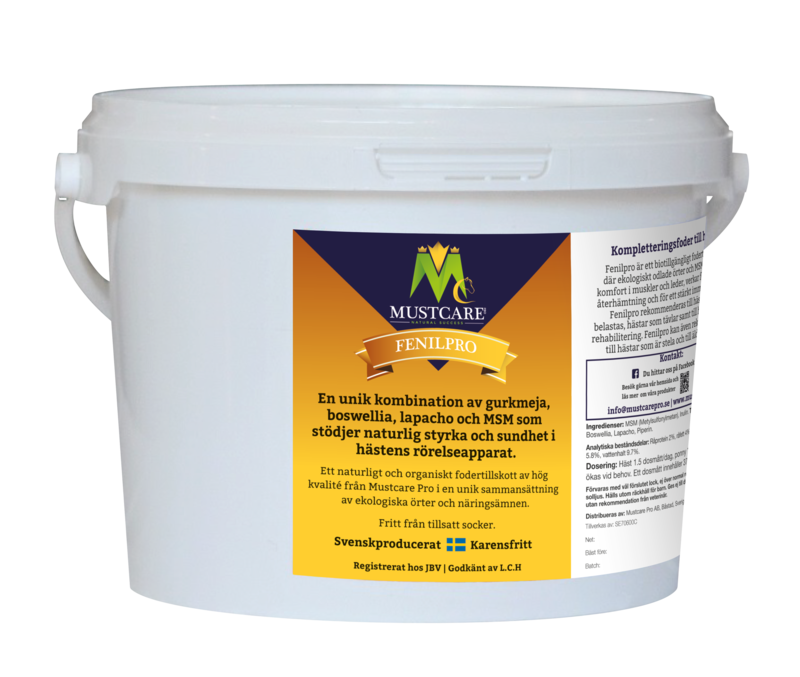 Fenilpro is a powerful herbal mix with MSM supplement for horses that supports muscular and joint comfort and also helps to retain natural health in the musculoskeletal and immune systems. Fenilpro is recommended for horses in training, competing horses, horses undergoing rehabilitation and elderly horses. The main ingredient in Fenlipro is MSM, this is provided in a unique combination of natural and organic ingredients such as Turmeric, Black Pepper, Boswellia and Lapacho. The result is a top-performance, tasty and highly bioavailable compound, free from sugar and chemical additives. Fenilpro is availiable in liquid and powder form. Liquid: Normal dosage is 30 ml/day but can be increased to 50 ml/day. The bottle contains 1 liter and should be stored hygienically at room temperature or cool and should also be kept out of direct sunlight. Powder: Normal dosage horse 1.5 dose measures/day, pony 1 dose measure/day. 1 dose measure contains 37 ml/20 g. Should be stored dry with lid well closed, not above normal room temperature, not in direct sunlight. Keep out of reach of children. Fenilpro should not be given to pregnant or lactating mares without prior consulting with veterinarian. 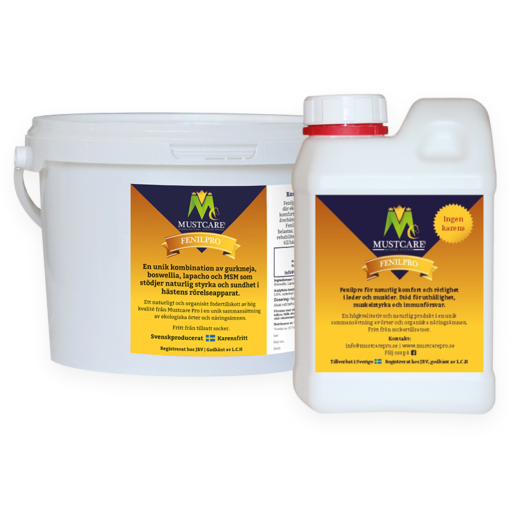 We are concentrating in producing natural and clean feed supplements for horses – free from chemicals, colourings and perfumes. 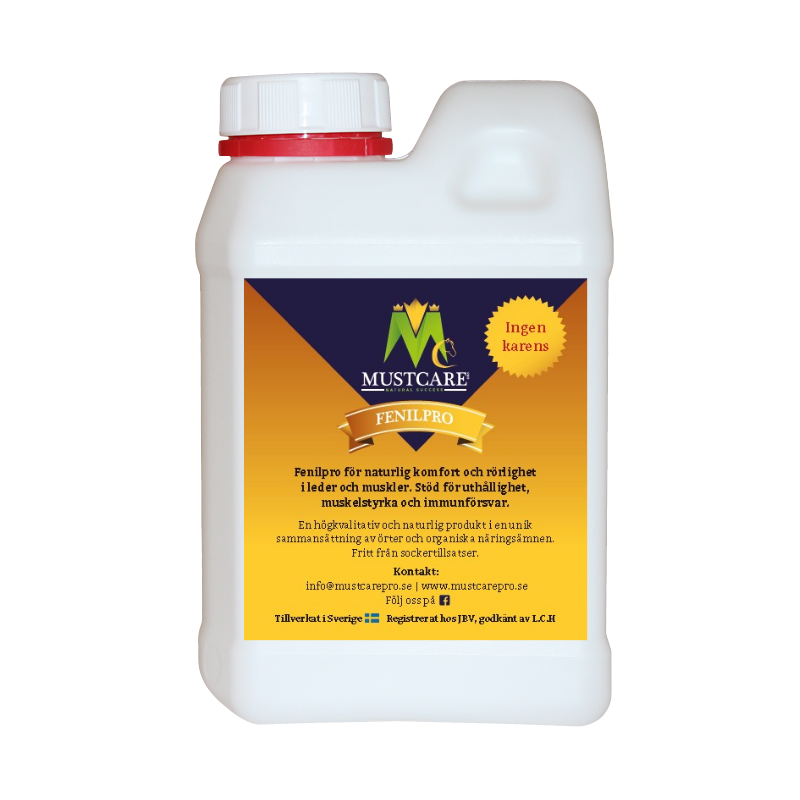 Our herbal mix with MSM for horses, Fenilpro, is completely in line with this philosophy. All content have high traceability reassuring that the ingredients are cultivated on uncontaminated land. We produce with licensed manufacturers and are environmental friendly. Fenilpro contains of high quality MSM, laboratory tested to ensure the quality and high bioavailability. The usage of MSM supplement for horses can bee seen in muscle recovery after hard work as well in general agility. Turmeric (Curcuma Longa) is a natural and powerful antioxidant with the ability to neutralize free radicals and protect the horse from infections and parasites. Turmeric can also strengthen the horses’ energy. The active substance, Curcumin is sensitive to air, moisture and air which put high demands on cultivation, harvesting, processing, transport and packing. The Turmeric present in Fenilpro is carefully selected and approved in three laboratory tests concerning Curcumin concentration and that it’s free from traces of pesticides and heavy metals. When Turmeric is used in spices it’s often low in Curcumin and sometimes also have high levels of pesticides and heavy metals. Black pepper contains Piperine, a substance that works as a powerful excipient for Curcumin and will boost its effect several times over. Herbal preparations of the Lapacho tree has been used for thousands of years. It comes from the bark of the South American tree Takeebo also known as Pau d’Arco. 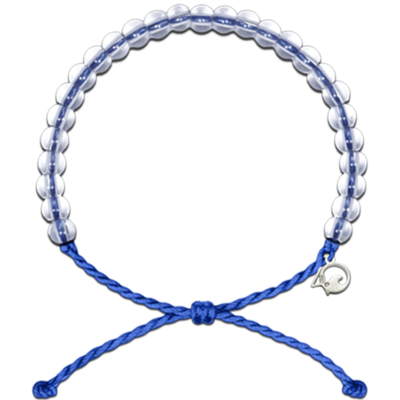 It contains a powerful antibiotic substances as well as highly available Iron and around 20 minerals. Lapacho can increase the number of blood cells and strengthen the blood count, as well as aid in cell formation in the horse. The Lapacho tree is highly resistant towards spores, viruses and fungus. Boswellia is closely related to Devil’s Claw and is considered to have a strengthening effect on muscles and joints. Boswellia is known to support circulation and contributes naturally to a healthy musculoskeletal system and healing. The horse’s foremost source of MSM is grass. Grazing horses obtain around 1 gram of MSM per day, depending on grass quality. But as MSM is a sensitive substance, the levels of MSM decreases dramatically when grass is dried for hay. In haylage it’s close to non-existing. The horse’s need for MSM will increase with more intense training as well as with rising age. The organic sulfur compound – MSM or Methylsulfonylmethane – is in weight the 8th most common substance of the body and is essential for a long row of body functions. Among others MSM contributes largely to the elasticity and permeability of the cell walls which in turn improves the uptake of nutrition and vitamins. 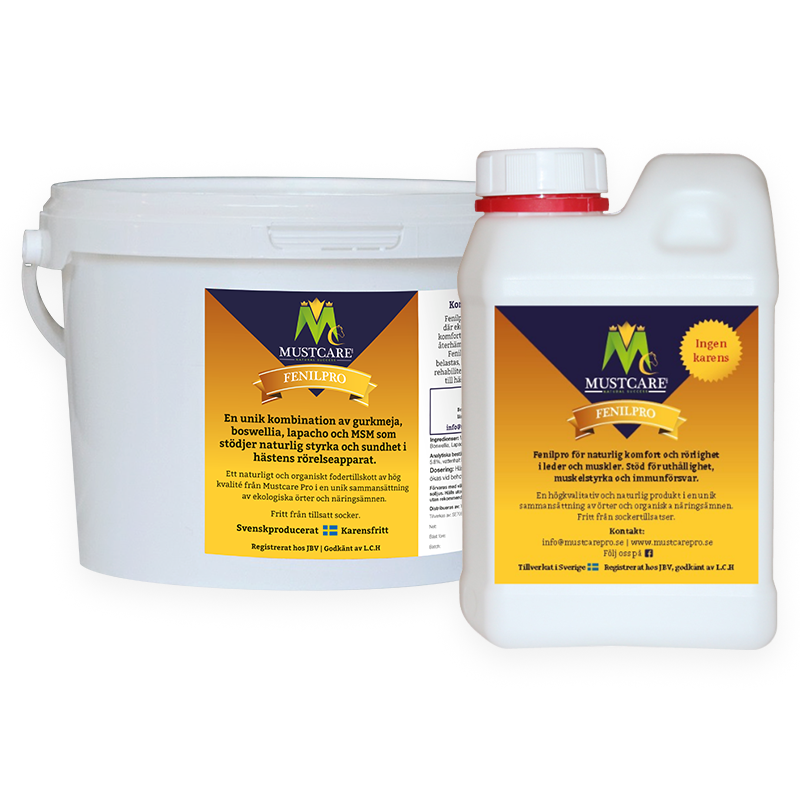 MSM also contributes to the oxygenation and elimination of waste products of the cells which makes MSM a great antioxidant. MSM is important for absorption of several B vitamins and the production of amino acids, enzymes and hormones. Further it’s also crucial for the uptake of Glucosamine. 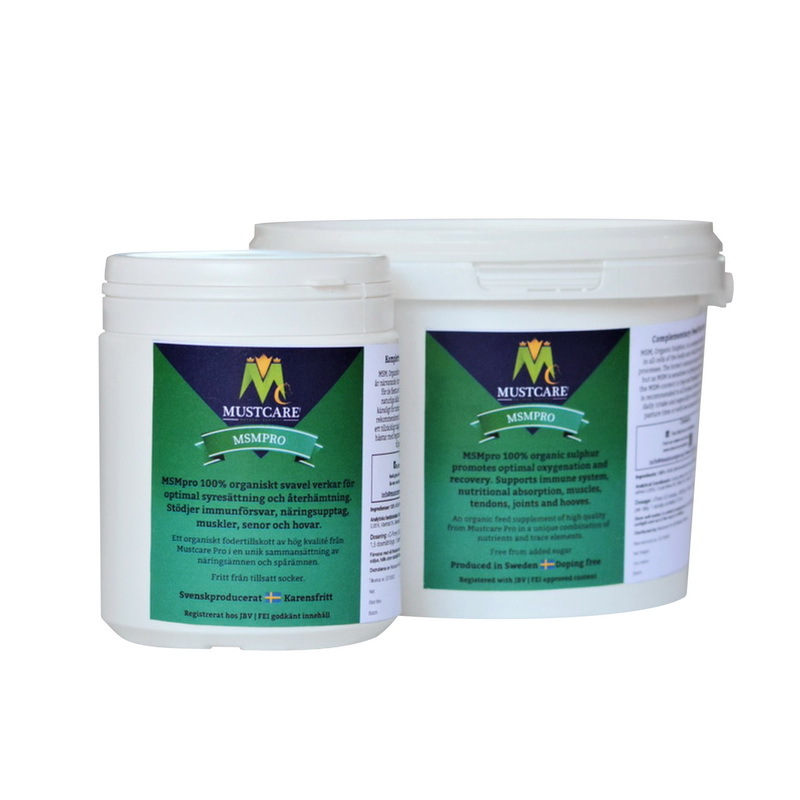 MSM provides natural nutrition to the horse’s muscles, tendons, cartilage, hooves and coat. MSM can also contribute to raise the threshold for lactic acid and suppress free radicals. The dry mix or powder also contains inulin, a water-soluble metabolic dietary fiber – prebiotic, which provides the good gut bacteria with nutrition and stimulates gut movements. Inulin contributes to better conditions for an effective nutritional uptake.